Spend a relaxing day learning how to make these deceptively simple, manipulated fabric origami patchwork shapes. I devised these clever little textural patchwork segments back in 1997 when I was studying for my City & Guilds Part 2 (now Diploma) in Patchwork & Quilting and they are still going strong today! Triangle Trickery units look great made in cotton fabric but are even more spectacular when made in silk! 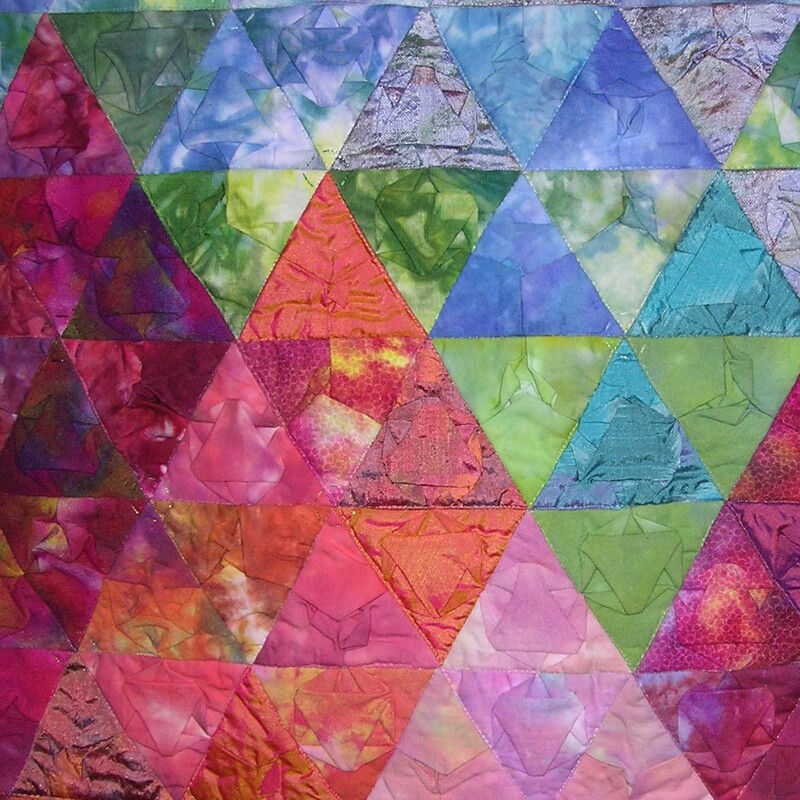 During this course you will learn how to make ingenious little triangle patches to add an extra dimension to your work. Using folded and manipulated fabric you will produce a range of origami patches to add texture and interest to your work. You will learn the basics of these clever little hand pieced patches and then progress to some stunningly deceptive simple variations, with ideas of how to use them in future projects such as bags, Christmas decorations, box lids and panels in wall hangings etc. Beware, you may get hooked on fabric origami and want to try some of the many paper exercises available in fabric! After mastering the basic technique, you will move on to working several variations including a cathedral window style that uses a lot less fabric! Ideas for small projects and finishing techniques will also be discussed. ¼ metre of Quickscreen Vilene – this has a blue Isometric grid printed on one side and ¼ metre Quickscreen Vilene with blue square grid printed on one side, this is usually available from Quilt Direct. If you have difficulty finding it Light Weight Sew-In Vilene is a good alternative. 3 - 4 fat quarters of cotton fabric. These can be an assortment of colours in plain, hand dyes, Hoffman batiks, Moda Marbles, Fossil Ferns, Oakshotts etc. Avoid large or heavily printed fabrics – the technique will not show! Janice Gunner is textile artist, quilter and author. She learned how to embroider at the age of five, made her own clothes from the age of 10, has been quilting for 44 years and has spent almost 30 years of those teaching patchwork & quilting, including 23 years teaching City & Guilds courses. Janice is currently studying for a MA Textiles at UCA Farnham.